Auriculotherapy is treatment of the external ear to treat problems elsewhere in the body. It is also known as auricular acupuncture. Auriculotherapy has been in existence for thousands of years, but only since the 1950’s has it been seriously developed and more widely used. Auriculotherapy is thought to work through reflexes. By stimulating the external ear, information is transmitted into the brain, from the brain down the spinal cord, and out to another area of the body. The external ear has been mapped to show what points on the ear correspond to which parts of the body. The map looks like an upside-down man on the ear, with the head at the lobe, the back on the outside of the ear, and the legs at the top of the ear. Most commonly, auriculotherapy is used to help people quit smoking. Auriculotherapy for smoking cessation helps decrease the intensity of the symptoms of nicotine withdrawal. It helps to lessen symptoms such as irritability, craving a cigarette, and even nausea. It cannot eliminate the symptoms completely. However, when combined with a strong desire to quit, the success rate is very high (80%-90%). Auriculotherapy can also be used to aide with weight loss. When used for weight loss, it helps to decrease the appetite. By having a lower appetite, you should be able to wait until you can eat healthy food instead of whatever is convenient. Auriculotherapy can be performed using small acupuncture needles or an electric stimulation machine. 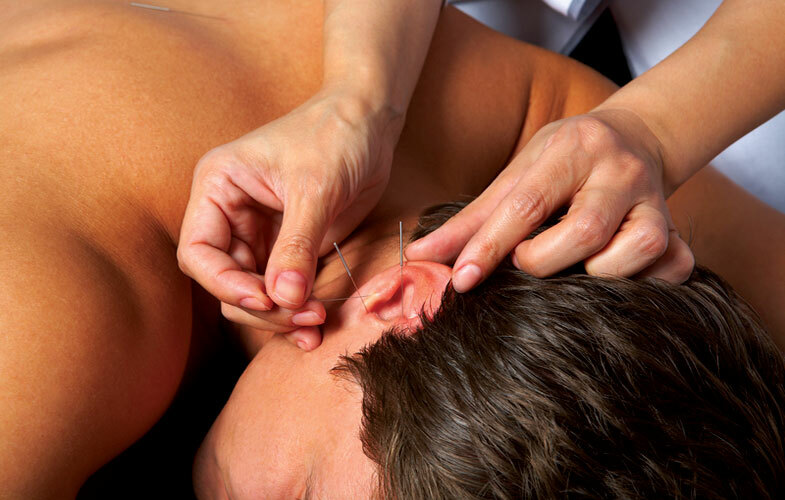 Dr. Emily Brueggeman uses small acupuncture needles when performing auriculotherapy. The treatment is painless, and the needles are left in place for approximately 20 minutes. For more information about either package, or to make an appointment, please call us at 618-692-0000 or contact us.